Welcome to my Castle on the Royal Blog Tour. 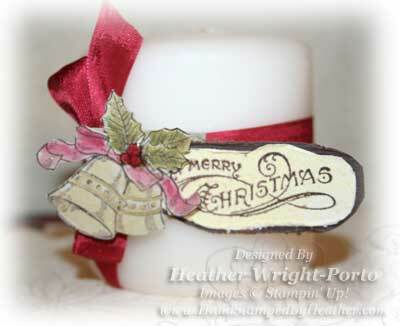 I am so happy to share and feature the Bells and Boughs stamp set with you. It's a holiday set featured in the Holiday Mini and included in one of the Holiday Bundles. It's a beauty!!! And you'll see why I love it so much! Each tour I try and do something different. 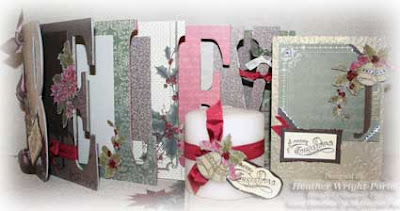 So for this tour, I am showing three projects decked out with Deck the Halls Designer Series Paper and of course the Bells and Boughs stamp set: Chipboard Album, Candle, and a Card. Please be sure to bookmark this page or come back and visit my blog as each page of this album will later be detailed in another post, as this project is many pages and yes, it took forever (LOL) due to cutting out all those bells, poinsettias and holly leaves. All the Bells, Pointsettas, and Holly were stamped on Sahara Sand cardstock, watercolored using a Blender Pen, and then cut out. Early Espresso, Cherry Cobbler, Old Olive, Always Artichoke are colors used. Each page and all cut out images were sprayed with the new Gold Glow Smooch Spritz (love this stuff). All berries are covered wtih Crystal Effects. All poinsettia have our new Clear Rhinestone Jewels for centers. Bells and Boughs is the only stamp set used in decorating this chipboard album. The next featured projects is a candle. This is such a quick and easy project you can do as a teacher's gift, a "thank you" gift or even as a hostess gift. Like the other projects, what takes time is the watercoloring and the use of Crystal Effects. But I just love how the Crystal Effects looks on the berries. I stamped the greeting in Early Espresso and then hand cut around the greeting. Then used the Distresser Tool to rough the edges. The Gold Glow Smooch Spritz was sprayed on the greeting. Then matted the greeting to Early Espresso textured cardstock and again manually trimmed around the greeting and then again roughed the edges. Adhered to a piece of a gold square, cardstock which you can't see. Then again used one of the bells I stamped, colored, and cut out and adhered to the gold square you can't see (used only for assembling). Tied the ribbon around the candle in a knot, then Punched a whole in that square/cardstock you don't see, and then adhered the greeting and bells with Stampin' Dimensionals. Then tied the bow and you're done. Lastly, I created a coordinating holiday card keeping with the color scheme, techniques, and of course the beautiful Bells and Boughs stamp set. 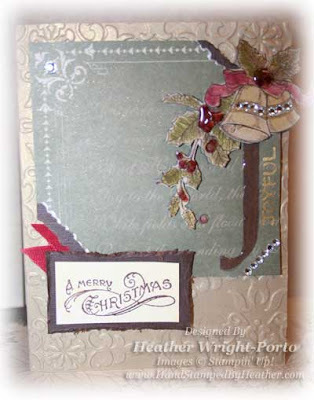 We will be making this card in my holiday card making workshop December 17th. The Brushed Gold cardstock is so thick that any of the embossing/textured impressions folders look great and provide so much detail. Here the Vintage Wallpaper folder was used. 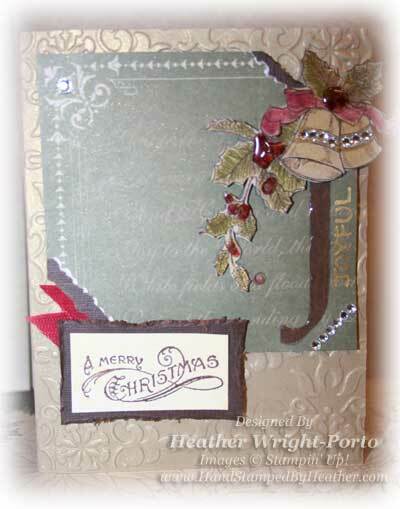 Then a piece of the Deck The Halls Designer Series Paper. The J (on the designer series paper) was covered with Crystal Effects. The berries on the Holly leaf were covered also with Crystal Effects. The berries/holly and Bells were again watercolored with a Blender Pen. The tearing tool was used as well. Gold Glow Smooch Spritz covers the Designer Series Paper. I wrote "Joyful" in Gold Pen manually however a rub-on would have looked great as well. And let's not forget all the BLING!!!! Love our new rhinestone jewels!!! I really hope you enjoyed these projects and they inspire you to make your own "Handmade Christmas" gifts, cards and decor. Enjoy the tour and all the featured artists! Oh, LA LA, I just KNEW you would do this stamp set proud. Your projects are AWESOME my friend, I can't wait to see the details on that awesome BELIEVE book. Wow! This BELIEVE book is awesome! I can' wait for the details on it. OMG, can't wait to see more of your Believe book. As usual your cards are awesome. Love the album. Great paper too! Heather...AWESOME! Love your Believe book...It was a pleasure working with you again! Oh I just LOVE the things you did with this set and the paper! They are all wondeful! I will be waiting for all of the details for the totally awesome BELIEVE book. Your work is beautiful. Thanks! Thanks for the inspiration. Love the candle decorations. Definitely will make my gift giving list this year! Love the BELIEVE book. Great job on the projects. 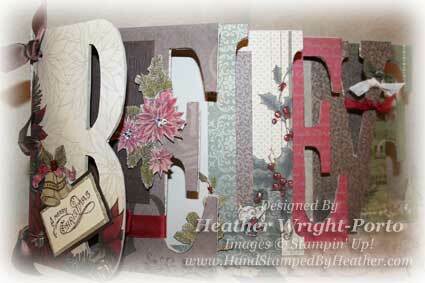 Gorgeous projects Heather! I LOVE the album and your photos are awesome too! I CANNOT 'BELIEVE' YOUR BELIEVE BOOK! HOW AMAZINGLY AWESOME!! TALENT, GIRL, TALENT!! Great projects - especially that 'unbelievable' BELIEVE book. Waiting on the deets...... THANKS for sharing!! Please, help me to find the popular dating sites. Thank you for sharing your beautiful work. The believe book is absolutely AWESOME!!! I love the the believe book... super amazing!! You did a great job on everything, but wow that believe album is incredible! Can't wait to see the details! WOW, These are gorgeous. This is my favorite paper and stamp set from the Holiday mini. You did an excellent job showcasing them. Thanks for sharing. Thanks for being part of the tour. You always have beautiful projects. And you make that set look easy. I'm looking forward to seeing the different pages in your book. thanks for sharing. Your Believe book is fantastic.... love it! Great gift ideas ~ thanks for sharing! Great believe album. The card you made is elegant. Beautiful projects heather. Love the chipboard album. Looks beautiful and so much work! Gorgeous projects. Can't wait for the details. Beautiful Heather! I love the chipboard album! TFS! Your projects are lovely. I need this set. TFS. I loved all your projects and can't wait for the details on the Believe book. Oh my you have created some beautiful projects. Love them all. That book is so gorgeous! 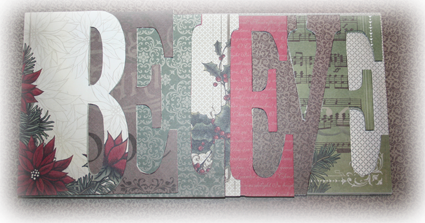 All three projects are great, but your chipboard album rocks the boat! Your projects are amazing! I love the Believe book. Just stunning. Jaw dropping Gorgeous!! Love the book, and all of the rest! Looking forward to seeing the how to's! you did such a beautiful job on your projects! I love them! 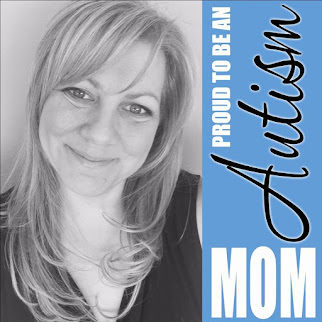 Awesome projects Heather! Thanks for sharing the details too! Looking forward to seeing all the details on the Believe book. Wow the believe projects is beautiful! Thanks for sharing! Heather: with all you did for the tour, you still came up with these beautiful creations. Thanks for being on the tour and for always rescuing us! Your hard work is appreciated.